He is a handsome dude. 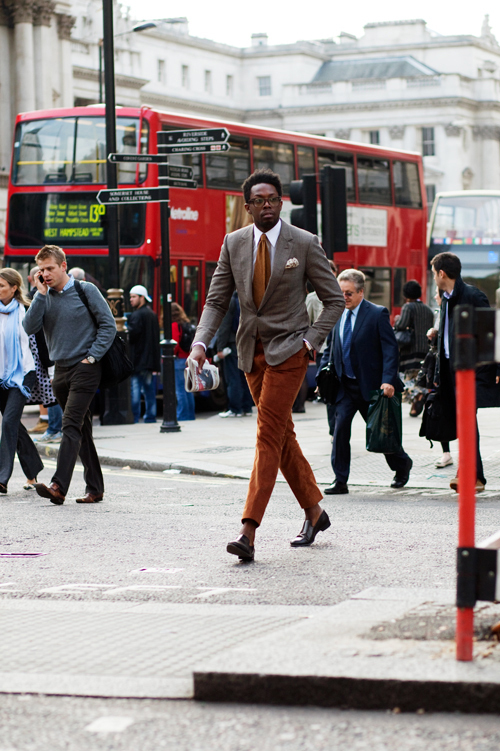 Love his tapered orange pants and matching socks and tie, and his Afro. What completes the look is the newspaper he is holding in his right hand! overall this is a great photograph, i love the bus in the background. love love ur action shots! Nice looks that blends some hard to work colors. Those corduroy pants look like their are either for the very fashion savy, or a very old man out in the English countryside. He's huge. Not a fan of the no socks, but otherwise very cool. Great clothes. But his posture, the purposeful stride. That makes the look. Quintessentially London and so so stunning! this is great! he is so tall and yet he is not afraid to still be himself and wear what he likes. chronicling the rise of a fashion house in BROOKLYN. traveling back and forth via MILANO, PORTOFINO and NYC. what a challenge. Really nice shoot. Like his look. Love him, hate the pants and bare ankles! You really had me until I scrolled down to see the rest of the photo. Hey, I thought they got rid of all the double decker buses in London? Wow that guy is tall isn't he!? Wow, that guy looks tall! It's a look I might typically associate with smaller physiques, but he really rocks it! i WAS GOING TO MAKE THE SAME COMMENT !!! Excellent! Only the English seem to mix colors and textures together like no other. Americans take note. I miss London!!!! Love his style and the color selection..but I still want to lower the hem of those pants to the tops of his shoes…sigh..and give him a pair of sheer silk men's socks – maybe brown with thin stripes.. This guy is soooo tall !! Great look and pants. Thank you. great job. I love all the colors here! He is one freaking tall man!!! He must be expecting a flood too! The guy in the background on the phone is nicely, if quietly, dressed too! ……Despite my disdain for the whole flood pants "look" I have to admit he looks very striking and most definitely not in a slightly comic pee wee herman way. Oddly enough I have a Spy cartoon in my house of a Victorian politician the Marquess of Hartington (subsequently 8th Duke of Devonshire) and he's wearing a pair of ankle baring pants that look very similar to these. Beautiful color coordination of the tie and pants with the very neutral jacket.Too bad the pants look like they have been through a hot dryer cycle—–a little too tight and short. That's a big man in floods. He's courageous. Wow he looks amazing. Especially compared to all the drab looking business men walking past him, he is a breath of fresh air! His pant length is spot on. I like the mix of colors and textures, as well as the pocket scarf and newspaper, but those pants are just not flattering… tapered pants don't work on every body type, and these are also way too short for this gentleman. Its so inspiring to see that color pants. In a store, folded on a table, it could seem impossible to wear. But seeing them combined here gives courage to know they can be worn, and worn well! Just a little cuff under the jacket, a great tie and some texture in his jacket pocket make this one a keeper for sure. The gentleman in the backgroun looks like George Soros. Oh, man! Fantastico. I love people who show pride in their stride, regardless of the job. Like the color of the pants, but strongly dislike the length. Fantastic. That is all I have to say. Fantastic. i suppose if you're going to stand out from the crowd you might as well look good doing it. Nice pic! I've seen this guy before in Paris and I think he goes by the name " Sauvage". But I agree He truly does have style beyond belief, but If you were to see him in person you would understand what I mean. Sorry N.Y Im heading to London! great photo! love the rust color, very chic look! I want the color of his pants! Awesome! what a cool looking guy! i love this look, takes me back a few eras. the length and texture and color fo the pants are my faaaave! this is so London – lots of quiet looking people and then someone who stops you in your tracks -except of course noone takes a blind bit of notice. And just for the record they got rid of the lovely old Routemaster double deckers. But we have new ones. This is a new style double decker – you can tell from the closed doors at the front which mean you can't jump on and off. Very annoying at red traffic lights when you're in a hurry…. I love it! He oozes confidence! That outfit looks like it would wear anyone else, but he wears it for sure. I love to see men that take pride in a look that doesn't look too pretentious. Great as always! Just bought my husband a pair of pants about this length…I was afraid at first but this photo has given me confidence. He looks fantab. Me likey. Is he 7 feet tall? In the photo he towers above the others on the street, though he is in the foreground. His color choices (burnt orange and browns) are also great contrast to the mostly blue/gray clothed crowd behind him. The double decker certainly gives us a sense of place, but I wonder how the palette would be different without it. Maybe it's not a daring look for London, but from my seat in WV, I'm admiring how he's pushed the envelope with burnt orange skinny pants and a hankie. the shorter pant line and bare ankles IS what makes this look…italian men do the same. more Italian influence than English. hot. yum. single? alas, i'm not. Very striking and great mixing of colors. I like this picture not just because of the guy's clothes, but b/c of how candid it is and b/c of the unaware background. It feels so much more real, less contrived, more action. Fantastic! I love this and echo what Castleberry said about the gentleman's pants! That's what I call dashing! Cool and offbeat style, and an awesome capture. enjoy everything, except the excessively short pants. a sliver of flesh is always sexier than 3x ankle height. it loses its charm when it's overdone. to boot, high collars have been replaced with slimmer ones, but who's looking when you have capris on. Wow, I love everything about this shot. Adore men who don't afraid to wear what they like! Warm сhocolate colour with grey, interesting mix. Love the cords and the autumnal colors, but, with winterwear, one should don socks. Wow! Great shot! Great subject! This is one of the best post ever. Everyone looks so good and happy. I'm trying to start my own local fashion blog but i'm a little shy about asking people to take their pix. Any tips? Great stride, confidence, effortless…the guy has style. I have been going sockless in winter for ever, only wearing socks in the evening or with a suit…as for the suggestion of "sheer silk socks" with cords… well, I wont say more.. The colors are put together AWesomely, those pants are superb. And I love the casual look of his handkerchief. I'm not at all opposed to tapered, short pants, but I think that, when considering the overall silhouette, there's something about the combination of the pants, the socklessness and those fairly dainty heeled shoes that bring the twinkle-toed hippos from Fantasia to mind, though the gentleman is certainly no hippo: there just isn't enough of a foundation to the outfit. I have the same issue with long legs and small feet, and as much as I love tapered pants and little italian loafers on other guys I just can't pull them off together. Were the pants longer and more columnar (or the shoes changed for boots!) I would stand up and applaud. Genius look. Très dapper! I love it! Long, long legs and a great colour combination. Just gave away a curdoroy shirt in this colour… Oh, why did I??? He looks great, like a well dressed, relaxed gentleman, who doesn't have to hurry anywhere else, only to cafe, to order a cup of espresso and read his paper. I long for seeing the end of too-short pants though. I just can't stand it. Not only because it made nearly everyone to look just ridicuolus, like a impoverished paperboy form Charlie Chaplin movie, but I find it just stupid and exaggerated, exactly as I find too long pants and t-shirts of gangsta style studpidly exaggerated. this shot is great! Center of attention! He has got it going on. Co-ordinated right down to the rims, socks and pocket square. Very impressive sense of style. Everything fits and works so well together. The tailored pants, no socks with those amazing loafers. Wow. very handsome! would love to see the brooch up close, simple, beautiful addition to a great outfit. absence of the socks cannot take the style away form this dapper chap! I have spotted him many times at fashion week and rumor has it he is launching a clothing label. couldn't find any more information. overall, I think Scott takes the credit for his great eye! we love you sartorialist. Now THIS I love! The fit, the colors, the accessories, the hair, the confidence! And those shoes…they are amazing. Love the matching tie and pants! Genius! WOW! Handsome, tall, stylish, confident, CAN PULL OFF ORANGE/BROWN SUEDE(?) pants! What a combo. Very nice look. I like tall men, love cropped trousers and no socks. THE GUY IS PRETTY TALL, SAY 6' 3, 6'4. I KNOW BECAUSE HE WAS STOOD THREE PEOPLE IN FRONT OF ME AT THE SARTORIALIST BOOK SIGNING IN LONDON'S LIBERTY DEPARTMENT STORE. TO GET AWAY WITH THAT LOOK IN PRETTY CONSERVATIVE LONDON I IMAGINE HE MUST WORK IN HIGH END BESPOKE TAILORING….PERHAPS I AM WRONG, BUT IN ANY CASE….HE IS 'REPRESENTING!'. Like flares and cuban heels in the '70s, one day men will look back at this and think, what was I doing? i see a great many comments about him not wearing socks….who needs socks if your skin tone is that beautiful? Behold, near the street sign, shhhh… – someone wearing a baseball cap. A back to front one at that. Cute, faboulous, elegant, chic, cool.. The colours are stunnig also! Love it! Bravo Scott! This is officially my new favourite sartorialist shot. I thought it was worth my first comment since the years I've been following you too! you ARE a bit of a fascist, aren´t you ? This is a good looking dapper youngster! That is one tall man. This is a fantastic shot! Love the suit!! It looks so NYC but it's London – yay! I was cycling down the street behind this guy the other day and couldn't help appreciate his matched socks and trousers so I'm glad you've actually caught him on camera! To my eye everybody in the photograph seems stylishly. and I think he is chic. Wow, this man is bursting with confidence! Stands out in every way. And his eye-catching yet completely wearable outfit tops it all off pretty nicely. Amazing! Love it! Love the risk-taking Viv Westwood-esque look. Would love to witness his fashion changes through the week. Tomorrow, shades of green? Weekend, cricket jumpers, heavy linen dispatch shorts? Questions, questions. He's a real mover this one! He's head and shoulders above the rest in more ways than one. Love this shot! Handsome man! Everyone looks busy in this photo, but the man in the middle looms large over the others. I don't know if it's the perspective or what, but it's a great shot! It's his job to look good ;-) Besides all that – he is a great guy! His name is Sauvage Adrian. oh, oh! love it! i love especially the way his personality seems to come across here through both his clothing (and its fit) and his posture/carriage. looks like a fun guy to know. For me, the coat makes the outfit. The orange pants would be outrageous with any other coat. Perfect blending of tonal ranges! The decision to wear black loafers instead of lace ups or even brown shoes makes a world of difference. the inclusion of socks, unless they were chocolate brown, would ruin this pairing! I highly support the puffed folded pocket square as well! nice touch! Now all he needs is a hat! A dark chocolate brown or black bowler would do nicely! OR even a deerstalker would do well i think, just enough patterning to crown it all off! It's Sauvage! He always looks great and well turned out. Nice to see a straight guy dress beautifully and make an effort. Perfect picture!! The people behind him are so small and without style…!! oooh!! no socks!! very nice!! what lens are u using? you're pics is so beautiful, i need the same one ! I was wondering how long till someone said his name ;-) Sauvage is great, always super stylis, and of course it helps to be this tall. Great shot! Reminds me of Will Smith in pursuit of happiness! Love it! Love his colors and love his posture and gait. I like the colors he has going on here. I don't think that the floods with no socks is a good look here, but other than that, I like it. Quelle classe! C'est EXCELLENT, j'adore. Maybe I am too conservative, but he looks like a caricature from the waist down. Lovely man, great outfit–as an earlier commenter said, he's dashing. I don't usually like short pants, but in the context of the rest of his look (and his obvious height and strength), there's something really charming about his delicate little ankles! love this picture, the colors, the style. love everything about it. it is a very comfortable piece. This guy would be beyond brilliant with longer trousers. Sorry, to me the short pant looks clown-like. I hope I never get used to them. i love a dapper man, especially when he throws in his own specialness to his look. it's delish! impressive man. would love to see his next day look. So Refreshing to see, This guy is so so cool. I love the way he's so comfortable with himself and I ask the people who criticize, What would you rather see, the people in the background who don't really care for fashion or this charming debonair fashionista who has his own style???? That's a tall dude. His legs look a mile long. Maybe a 3 button jacket would suit him better. I usually focuse on socks when pants are short. But here the bare ankles are just perfect. Ah, he is brilliant! The trousers look amazing! I’m way behind on the date but he looksss amazing!! !